They were giving out samples of these at our local mega-grocery complex and I tried them. The cheesy garlic bread was decent, but that's not a flavor you can scarf down a whole bag of. I'd tire of it after just a couple of handfuls. Maybe that's good. The chicken and waffles was, in my opinion, disgusting. The maple syrup flavor overpowered pretty much everything else. It was a big bag of maple flavored chips. The sriracha was my favorite by far. It was like a fiery barbecue flavor or something. It led to some almost instantaneous heartburn, but they were yummy. 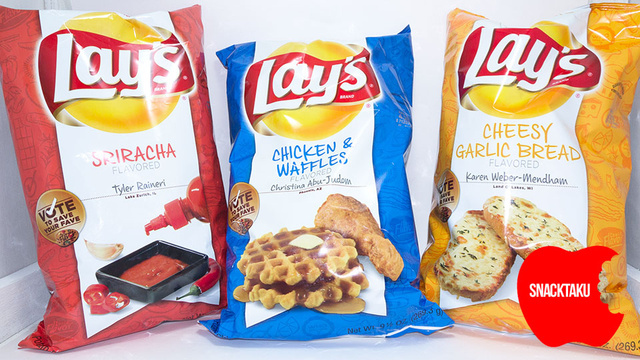 I predict that flavor will win the vote and stick around. JT88 - Thanks for the feedback. I hope the Srirach sticks but I can't take that risk. Sadly, I was reading online and looking at opinions and it appears to be a huge mixed bag of what everyone likes. I've heard good and bad about all of them. Chips are my BIGGEST weakness though - so I have to try them all. Yes old man - While I will be buying a bag of each of these - they will be hidden away until AFTER lent is over. If you eat the chips with a meal, they're a side, not a snack. If you have the cadbury eggs and/or cookies with a meal, they dessert, not a snack. cokeboy - you read my mind. On Valentines day I had this discussion with the lady and I told her I'm giving up Snacks but not deserts. She asked me what the difference was and I told her that Deserts were part of a meal - an extra course at the end. Snacking is eating random junk food at times other than meal times. However, even with this little loophole (and of course anything involving Catholicism SHOULD have a loophole) I'm sticking to my guns. Chips, Combos, pretzels, etc.... I'm doing away with them until afterwards. If I take her to a restaurant and have a small (shared) desert with her then I will accept that as not falling into my lent pledge.